With Marie-Louise De Geer, Björn Granath, Hans Mosesson, Ann-Charlotte Hult, Berit Nyman, Peter Wahlqvist, Anki Rahlskog, Svante Holmström, Robert Carlesson, Jan Lööf, Lars Hillersberg, Carl Johan De Geer, Lena Svedberg, Olle Jeppson, Håkan Alexandersson, Kenneth "Kenta" Gustafsson, Gustav "Stoffe" Svensson, Marianne Ahrne, Dan Nyman, Bo Montelius, Hans Nyberg. With John Giorno, Alex Hay, Steve Seaberg and Robert Rauschenberg. With Sören Brunes, Björn Granath, Lise-Lotte Nilsson, Björn Melander, Ulla Wiggen, Lotte Silferhielm, Erik Hallström, Carlo Derkert. 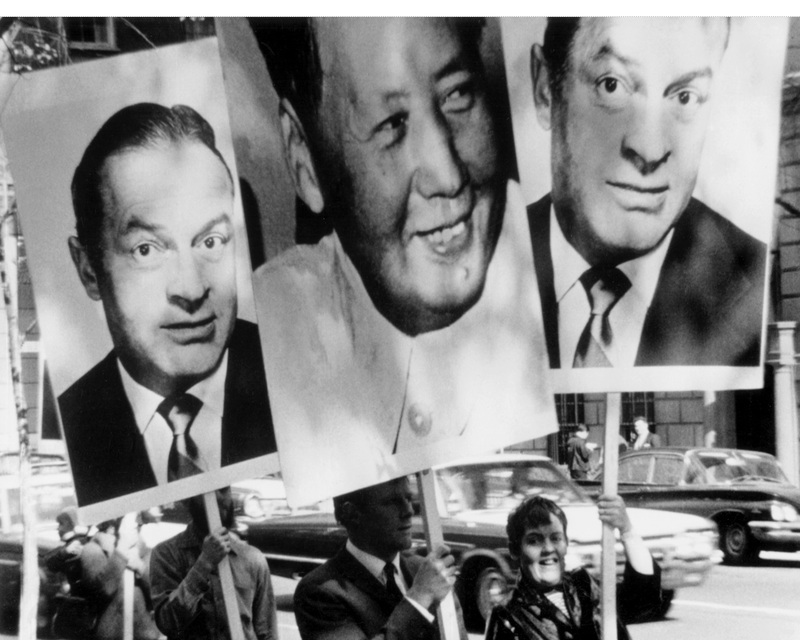 Mao-Hope March was filmed on September 1, 1966 in New York City. 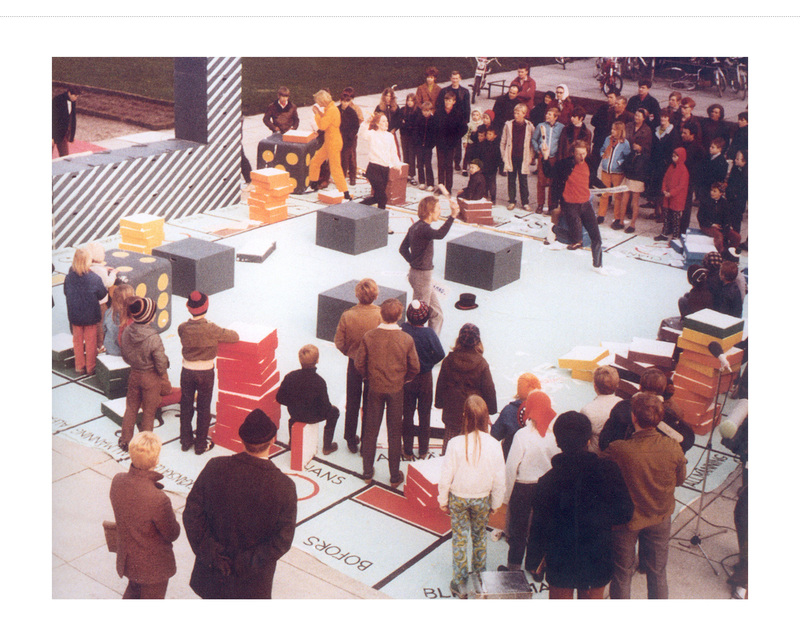 It was originally made to be incorporated into his theatrical work, Kisses Sweeter Than Wine, staged during 9 Evenings: Theatre and Engineering, October, 1966, at the 69th Regiment Armory on 26th Street in Manhattan, an event organized by Experiments in Art and Technology (E.A.T.). 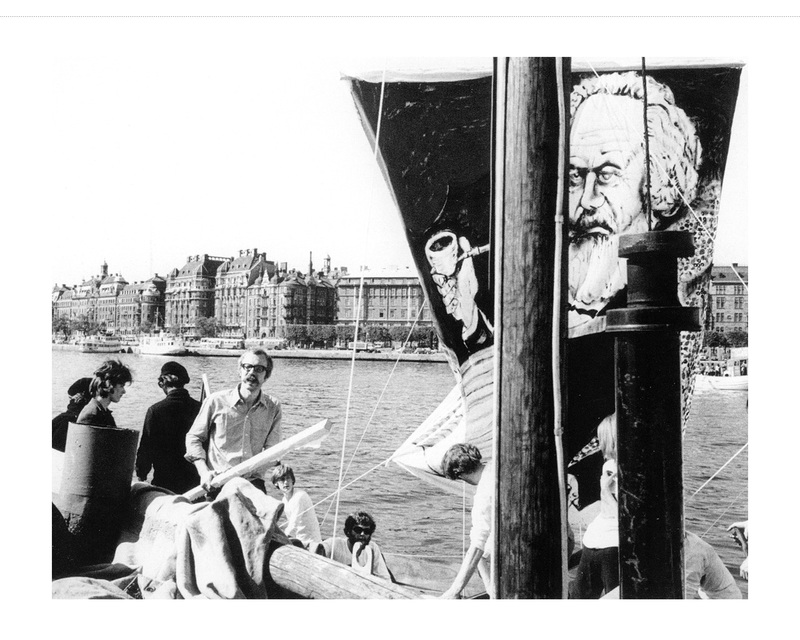 By 1973, Fahlström had decided to present Mao-Hope March as an independent work of art. It was included in his 1973 solo exhibition at Sidney Janis Gallery, New York, and in his retrospective exhibition at the Moore College of Art Gallery, Philadelphia, that same year. Mao-Hope March, as well as his 1968 film, U-Barn, were available as rental films from the distributor, Filmcentrum, in Stockholm. Alfons Schilling, the cameraman and film editor, is a Viennese artist who llived and worked for many years in New York City. 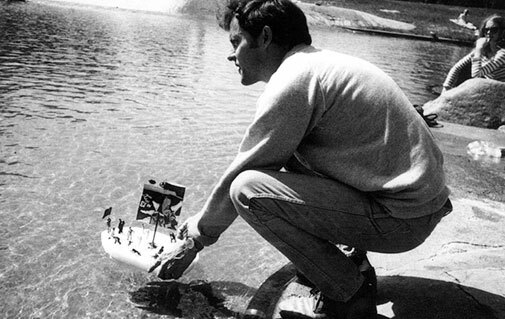 He was the principal film documentarian of the 9 Evenings performances and created many of the props Fahlström used in Kisses. Bob Fass, the interviewer, is a well-known radio personality whose regular program on listener-sponsored WBAI in New York City was a favorite of Fahlström, who listened to radio, music or television while he worked. Wait a second! Let me see. I don't know. That isn't Bob Hope but I don't know who he is. I like Bob Hope, that's for sure. Oh yes, I love the television. Very tough question. Up and down. How about you, sir? Are you happy? why shouldn't I be happy? I went on that $99 thing that Greyhound gave out. I took every day the world what it was. So why shouldn't I be happy? And with this Bob Hope thing, I think it's a publicity campaign because he was on TV the other day and probably his book that he did or something about Russia. And what's the connection with Mao Tse Tung? The connection? That I wouldn't know now. Let's say he's in town for some sort of publicity, that's all. Oh, I thought you meant that Mao Tse Tung was in town. No. Well not that I know of. Was it a strike against something? Are they protesting somebody? They're running Bob Hope for some kind of political office? There's somebody else's picture there, too. Yeah, I don't recognize the other fellow. Recognize Bob Hope, though. Am I happy? Sure, I'm the happiest person in the world. Why? I've got my good health, I work, have a nice family, so why shouldn't I be happy? What do you make out of that? Do you know? I don't say. They're all sick in the head, maybe. Certainly! Do I look happy, huh? Because I live the type of life I do. What type of life is that? The type that you don't. You know, it really stops you, you know. It makes you sort of stop and wonder what is he running for? Because if you notice that most of these actors are going into politics now, like Ronald Reagan, for instance. 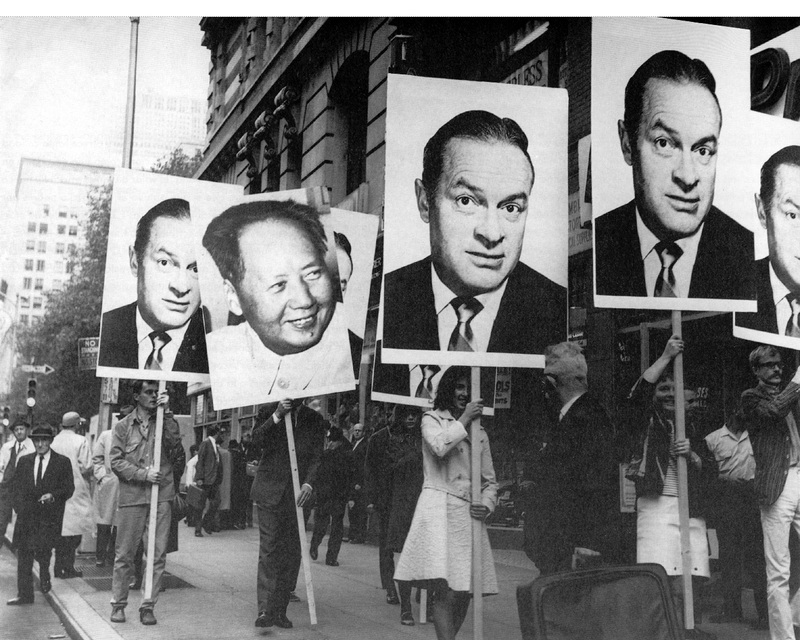 Bob Hope and I'm not sure of the other person, but it's, I think it's Mao Tse Tung. Is there some kind of connection? I wish I knew! Maybe the cops could help. I don't know. I was just thinking, maybe we ought to call Bob Hope and tell him about it. Very! It doesn't make you happy, does it? Doesn't make you very happy, does it? You seem to be unhappy. Well, I think something political, political going on with a picket line. Are you generally a happy man? Is there anything that makes you unhappy? Are they all pictures of Bob Hope? No, no, there's one different. I don't know. One looks like what's-his-name from China. The premiere, right? Chu? Is it Chu? Was it Chu? Was it the premiere from China? Is it? Huh? My boy is Bob Hope. I like Bob Hope. I don't like the other guy. Because I love this country and I love the people here and I'm very happy. Bob Hope for president! Bing Crosby vice-president! Is that Mao Tse Tung? What makes me happy? Seeing Bob Hope up there, for president. That's right! Make Bing Crosby vice-president. That's right! Bing Crosby vice-president! That's right!